The end goal of this handling exercise was to introduce the RFP as a control movement. What’s really cool about this old exercise is that it’s now fair game in the USDAA’s Masters Challenge class. Better get practicing. The push/pull-through is as likely to be a matter of wrapping the dog pretty much as in a threadle. However the target obstacle will be beyond the gap, and not necessarily presented squarely to the dog. 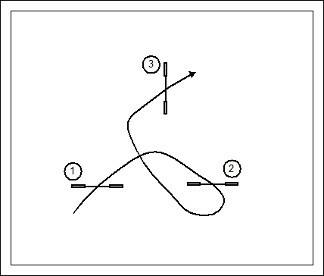 In this example the #3 jump is virtually a back‑side approach. In this example the wrap doesn’t turn immediately to the push/pull-through. They are separate events so that the moment of the challenge resembles more the handling exercise I showed above. 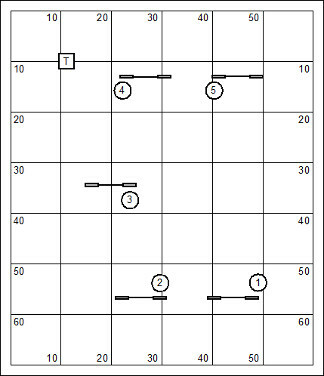 What is most interesting about this example is the long transitional distance from jump #3 to jump #4. This will be a common feature of the push/pull-through. This is a slightly more subtle application of the push/pull-through. 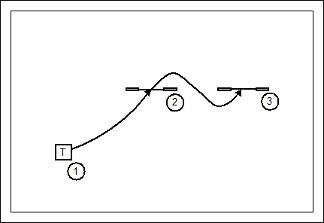 The 270° transition from jump #2 to #3 sets up both the #1 jump and the pipe tunnel as wrong course options. 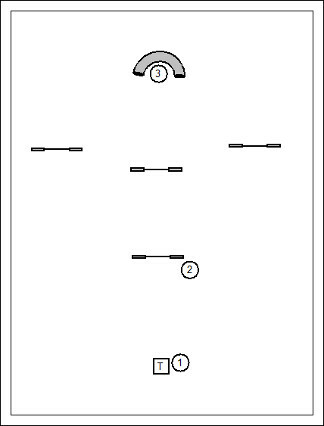 The push/pull-through has the handler drawing the dog between the pipe tunnel and the #2 jump. It’s worth noting that the pipe tunnel itself constitutes a backside approach. 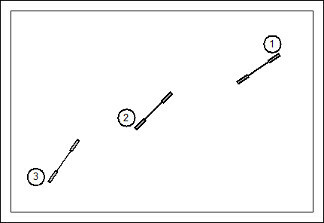 The final example above features an obstacle “cluster”. I wrote to some extent on this design feature of the Masters Challenge classes in my blog posting called Sensitivity. These challenging classes will borrow from European course design conventions. One of the chief differences from traditional American design is that the Europeans seldom reuse an obstacle. I suppose this goes to a granularity in scoring. If a dog drops a jump bar the designer wants to be sure that the dog has another opportunity to drop a bar. And this opportunity is lost if the jump has been reused. The obstacle cluster is a cagey design feature that allows a gang of obstacles to occupy a small place in space. I’m doing an end-of-year inventory of course design challenges. I have a couple judging assignments coming up early next year (USDAA). I’m delighted with the Masters Challenge class which essentially allows any evil thing I’ve ever imagined. Today’s topic is the threadle. In its most simple form the threadle is represented by two jumps set on a common plane, side-by-side with a small space left between them. Oh, and both jumps are intended to be taken in the same relative direction. 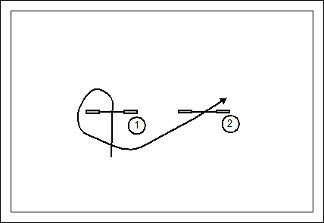 It’s worth noting that the Threadle in itself requires a “backside” approach to the second jump in the combination. Backside approach is the emerging common term to describe a jump (or other obstacle) that is presented with no clear natural approach, preventing the handler from simply releasing the dog to work. It is also known as a “managed approach” and a “blind approach”. A survival strategy for handlers with big dogs that don’t have tight & neat turning abilities is to turn away from the gap, rather than into it. Surely this strategy sacrifices a bit of time by increasing the distance on the flat. This approach also removes much of the risk associated with solving the threadle through the gap; but it introduces some risk that didn’t exist in the raw threadle. 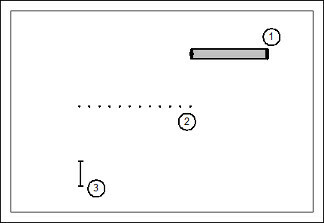 For example, it might be too easy for the dog to back-jump the #1 jump in this illustration. A course designer might be pouty about any handler not following his prescription for dictated handling (as though the “big dog that doesn’t have tight & neat turning abilities” is some kind of a threat to the field.) And so they’ll engage in design conventions to defeat the around-Robin-Hood’s-barn strategy. 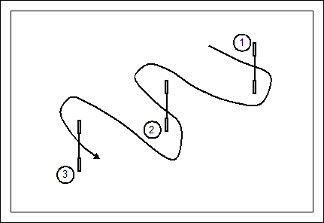 Here, for example, the course designer has rotated the jump introducing the threadle, making a left turn problematic and increasing both the distance of the transition and the opportunity for a back-jump of jump #1. The course designer might use other tricks to defeat the alternate approach to solving the threadle. In this illustration the designer did two things worth noting. 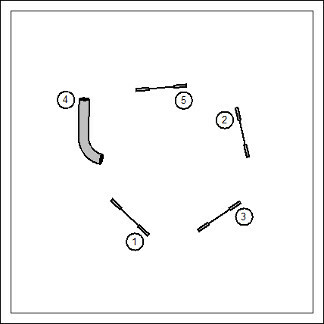 First of all, a wrong course obstacle has been placed to thwart a left turn and the angle of approach to the jump introducing the threadle has been set at an angle that invites the traditional handling of the puzzle. A threadle doesn’t have to be a pair of jumps. Just about any obstacle might be a part of the course designer’s conspiracy. This illustration just scratches the surface. Note that in the transition from the pipe tunnel into the weave poles the “entry side” of the weave poles is offered to the dog; so unless the dog is an amazing creature who absolutely understands his job in the weave poles then the handler might consider a bit of shaping to make the approach (and so, execute the dictated dance of the threadle). The transition from the weave poles to the jump begs the question… was the handler able to get to the weave poles with dog-on-right? At first glance you’d have to believe that the challenge has softened in this combination threadle because the intro jumps have been eased back to take out a dimension of depth in the approach to each subsequent jump. The set of these jumps has introduced the real possibility of a run-out refusal. This challenge did not exist in the simple threadle because the dog had no capacity for approach to the subsequent jump and therefore the subsequent jump is not eligible for a refusal call before the dog actually turns back to the gap. 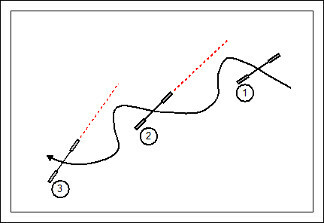 However in the case of a (so-called) “soft” threadle the refusal plane of each subsequent jump is live before the dog actually turns back. The threadle may be soft, but the heart is hard. Obviously, from a handling POV the dog needs to be geared down through this series of jumps to draw in the turning radius. This combination threadle increases the depth of the transition from the introducing jump to the subsequent jump. 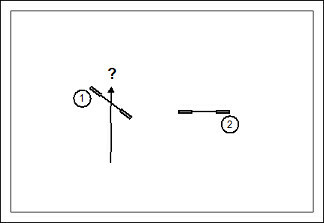 You might argue that this is no longer a threadle at all, but now a series of “back-side approach” riddles. But inasmuch as the solution calls for the Zee-shaped transition I’ll call it a threadle. The next step after “hard” is “a whole bunch harder”. 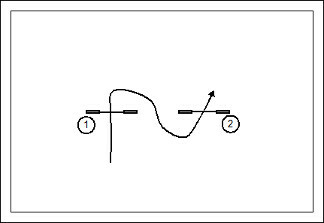 In this series threadle the dog will get a square look at the wrong side of both of the subsequent jumps. 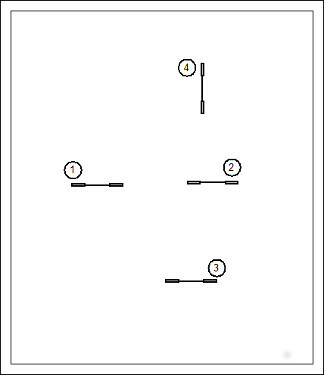 After drawing the lines (always a marvelous illusion!) it doesn’t really seem like such a hard thing to do. The course designer has a broad measure of control of the approach to the threadle challenge. And considerable attention should be given to the consequence of the approach. In the illustration the dog has a depressed-angle approach from the table. In general this disposes the dog to the right-turning through-the-gap solution. Though a more depressed angle will introduce to a greater extent the wrong course challenge of the second jump of the threadle. Certainly the threadle challenge will be messy if the depressed-angle approach is from right to left. That means that the handler will be fighting against the natural turning direction while faced with doing a rather precise and technical handling thing. Note that a threadle absolutely requires the handler to be in a control position. It is a challenge that requires micromanagement. The dog cannot be released to work. In the design of the challenge the course designer should understand that when two control positions are positioned with a fast transition between them, then only the young long-legged handlers who can outrun their dogs will survive the challenge. So if the course designer’s ambition is to thwart old men with arthritic knees, like me, then this is a dandy way to do it. If you have anything to add to the discussion of the threadle, I’d love to hear about it and share with the readers of this blog. I know that I pretty much left out any discussion of handling; because mostly I’m interested in the design aspects right now. I didn’t talk about the dismount of the threadle except in the limited discussions of combination threadles above. 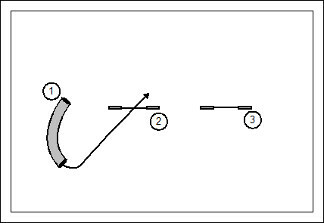 If you think about it, the dismount of a threadle is pretty much the same kind of riddle as the dismount of any obstacle or sequence. And so I didn’t give it the discussion that it might deserve. You are currently browsing the Bud Houston's Blog blog archives for December, 2013.